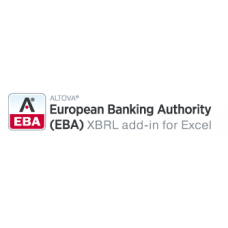 Altova European Banking Authority (EBA) XBRL add-in for Excel makes it easy to create valid EBA XBRL filing reports - directly in Excel. Simply enter the information in a spreadsheet template and click the Export XBRL button to generate an XBRL file for submission. End users create XBRL directly in Excel. No technical XBRL expertise is required. Excel template makes it easy to enter EBA data. 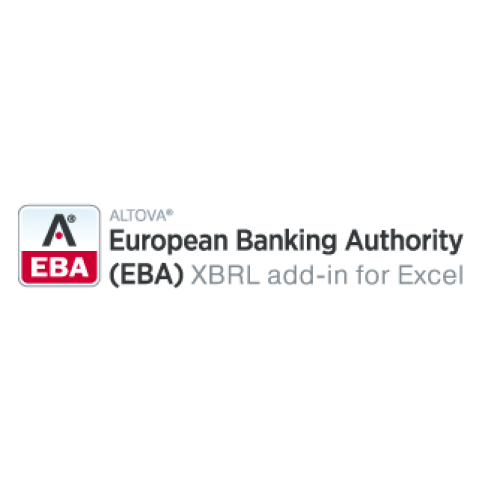 Export XBRL button generates EBA XBRL data. Import XBRL button imports EBA XBRL data into Excel. EBA Filing Properties entry helper assists with data entry. Tables selector window lets you navigate to or hide tables. Cell Documentation window provides useful information about cell contents. Altova Work in Process (WIP) XBRL add-in for Excel makes it easy to create valid XBRL WIP reports di..